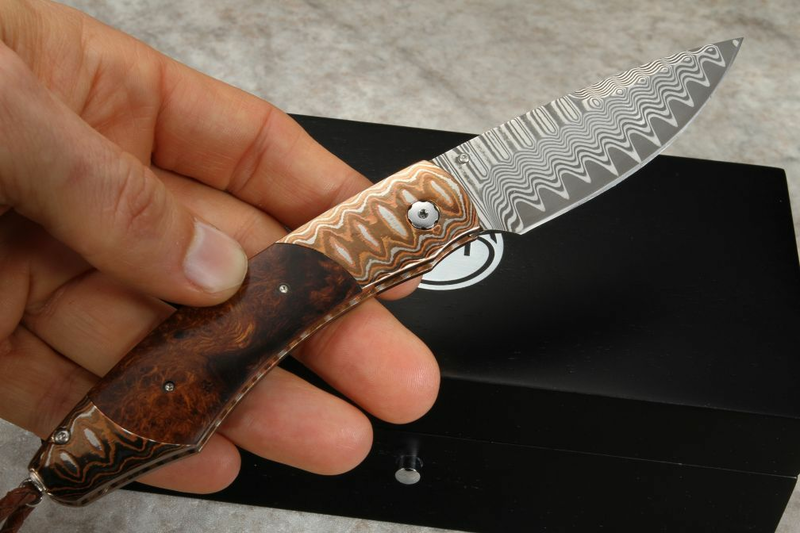 The William Henry B12 High Desert damascus knife blends artistry with function with its unique design and natural lines and look. Totaling a length of 7 inches and weighing less than 3 ounces, the High Desert pocketknife holds Willam Henry's masterful features in the collection, while retaining its strength in a compact form. With a blade measuring 3.06 inches, the Keelback offers great utility and ease for a wide range of work. 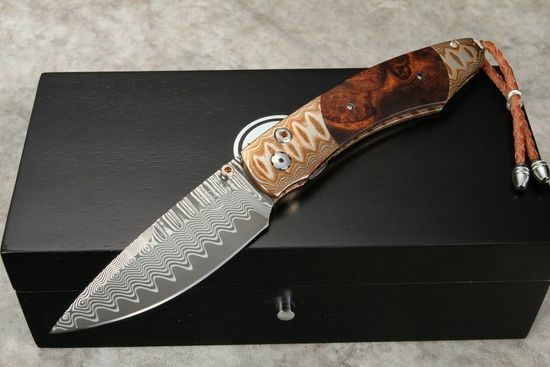 The blade features William Henry's wave pattern damascus steel featuring a ZDP-189 steel cutting core that gives the blade excellent edge retention, and resistance to corrosion. The blade deploys with the one-hand thumb stud and button lock system, both set with citrine to add to its design. The spearpoint blade shape allows for easy slicing, piercing, and cutting, making it a versatile tool. 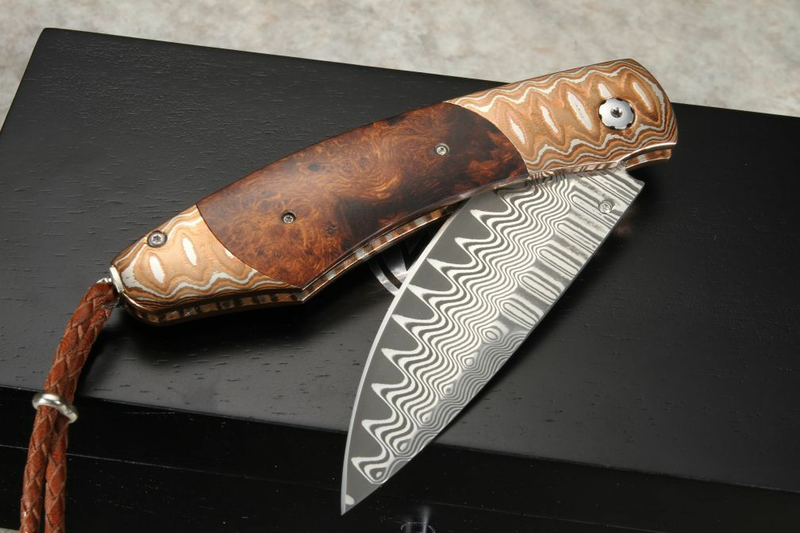 The handle, measuring 4.13 inches, is made with a beautiful piece of desert ironwood and double bolsters of mokume. 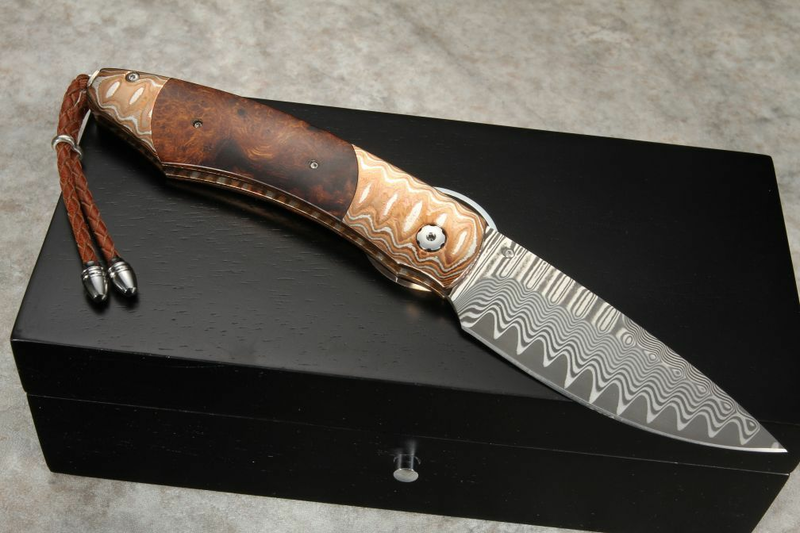 The mokume is forged layers of copper, nickel, and brass; is a decorative cousin of damascus steel. The blade stays securely locked up thanks to its button lock. Both the button lock and the thumb lugs are inlaid with citrine gems. The lanyard bail at the end of the knife handle adds another artistic element to the knife while allowing users to securely hold the knife. In addition, the knife comes with a high-quality brown leather carrying clip case, to expand your carrying options.